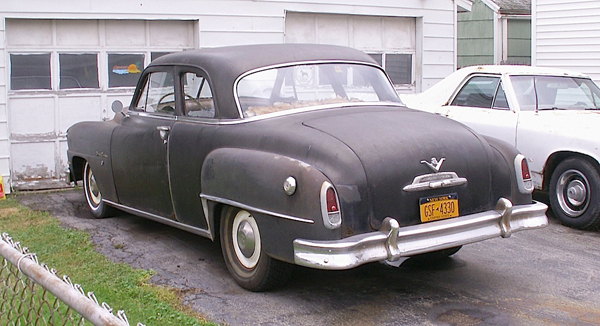 (Day 4 of Orphans week…) I’ve always been partial to cars like this 1952 DeSoto Fire Dome 8 Club Coupe. After being born I was brought home from Sister’s Hospital in Dad’s 1949 model. The trunklid of this black example, seen in Tonawanda, proudly and loudly proclaims that there’s a V-8 under the long, heavy hood. It put out 160 hp, and as the brochure tells us, was “…capable of breathtaking acceleration.” The last DeSoto was the very rare 1961 model, of which a mere 3,034 were built before the plug was pulled. Jim Corbran, RRofWNY The post RealRides of WNY appeared first on Buffalo Cars.